In the Call 311: Connecting Citizen to Local Government report, by the International City/County Management Association, one of the recommendations for implementing a 311/citizen relationship management (CRM) program at the local government level is to do so in phases. That’s the approach Washoe County, Nev. took after purchasing one of the leading CRM solutions on the market, QAlert by QScend Technologies, Inc. For Communications Director Nancy Leuenhagen, the pace at which the county has been moving to implement a CRM system is a key point. That has ensured the new 311 call center will flourish. Following a brief implementation period with the QScend project team, Washoe 311 opened quietly in 2016, having morphed out of calls that were directed to the county manager’s office. Instead of the continuing use of a spreadsheet and distilling long phone messages, the small staff made the switch to much more effective tracking, managing and report ing on service requests. As the county’s 311 team learned how to address the issues being submitted, it also developed a plan to visit various departments to discuss how the 311 center could help employees do their jobs even better. The staff did a lot of relationship-building in its first few months, helping departments understand how 311 would help their day-to-day operations, and in turn, learning more about what everyone did to build out QAlert to a greater degree. The staff added prompts to service request types to help collect meaningful information, as well as notification content to help manage the public’s expectations of each type’s resolution process. “The time we took to get organized helped us move forward through our next phase,” said Call Center Representative Maria Alvarado. Continuing visits with the departments help the call center staff make adjustments to the system’s many features, such as the knowledge base. Staff, through the control panel, and citizens, through the Web portal, can easily find accurate and up-to-date information, have informed conversations, or get issues resolved, with or without a service request being submitted. Shortly after the call center replaced the city manager’s service line, Washoe 311 was receiving approximately 40 calls per week. 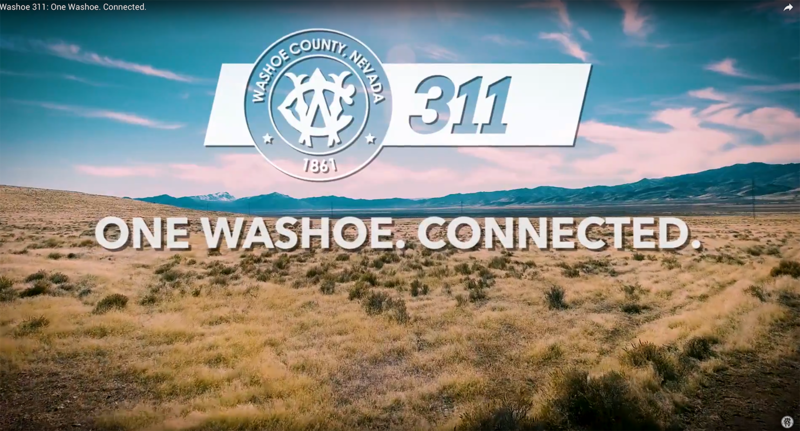 In the late spring of 2018, with a limited marketing push to launch Washoe 311 publicly, the number of calls per week doubled. Through late summer, Washoe 311 was receiving 40 requests a day. The promotional campaign will continue the remainder of the year. In order to alleviate some of the burden on the two-person call center staff, the county will add the ability for citizens to submit queries via smartphone app, text, Twitter and email. QScend Technologies, Inc., is an industry leader in web-based software for local and county governments. Hundreds of government entities and call centers across the country use our citizen request management software to improve citizen service, increase efficiency and effectiveness, re-engineer processes, and measure performance, making us the preferred provider of CRM/311 software in the United States.